Hi everyone! Stephanie and I created a new weekly meme called Recommendation Friday. Every Friday, one of us will give a new book recommendation! If you want to join us, we would love that! All we ask is a mention/link back to our blog and leave the link to your Recommendation Friday in the comments to we can check it out. This week my recommendation is one of my all time favorite books, Not a Drop to Drink by Mindy McGinnis. Not a Drop to Drink is about a girl named Lynn who lives a post apocalyptic America where water is extremely hard to come by. Her mother taught her to defend the small pond in their backyard at all costs. Soon, things start to change and Lynn finds herself defending the pond towards new threats .The tag line of the book is “Regret was for people with nothing to defend, people who had no water” and I think that’s one of my favorite tag lines for a book that I’ve ever seen. This is such an amazing debut novel! I read it back in 2013, it’s release year, and my love for this book is still going strong. It has so much drama and excitement! It was so hard for me to put this book down. The writing is amazing and Lynn is an insanely awesome protagonist. I’m always searching for strong, well written female protagonists and Lynn is perfect. Not a Drop to Drink is so action packed and I loved every word of this book. I’m definitely going to be reread this book this year. I highly, highly recommend this book to everyone. This book sounds so good! I’m going to add it to my TBR list. :) love your recommendation Friday meme. 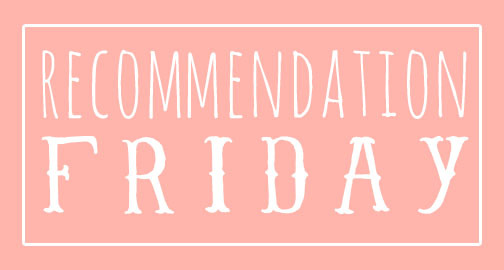 Recommendation Friday is so cool!